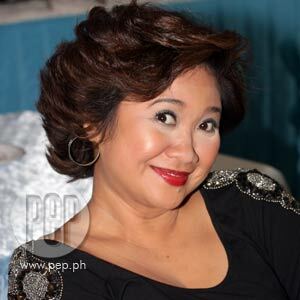 Comedienne Eugene Domingo has been getting good reviews for her performance in Working Girls. This sequel to the classic '80s movie by Ishmael Bernal, is a joint venture of GMA Films, Unitel Productions, and Viva Films. Reporters and critics who watched the premiere of director Joey Reyes's film last April 18 at SM Megamall raved about Eugene's performance. Some of them cited her character and acting as one of the notable highlights of the movie. "Gusto kong magpasalamat sa kanilang review na nagustuhan nila ang mga eksena na kasama po ako. At the same time, gusto kong magpasalamat again for the good script na isinulat ni Direk Joey Reyes," Eugene said at the set visit and press conference of GMA-7's upcoming stand-up comedy show Comedy Bar. Comedy Bar will debut this coming Saturday, April 24, after Imbestigador. While grateful for all the kind words, Eugene refused to take sole credit for her acting in Working Girls. She emphasized that the project was a product of teamwork, from the production unit all the way to the actors. "The actors can only do so much," she explained. "Alam mo ang artista, hindi naman niya kaya na mag-isa lang. Kailangan niya ng magandang script, mahusay na mga co-actors, especially Ricky Davao and Ms. Gina Pareño, at mahusay na direksiyon ni Joey Reyes. "Ako naman, sinusunod ko lang kung anong hinihingi sa eksena. Ako ay nagtitiwala lang sa direktor kung anong inutos niya. Ngayon, kung napapatingin sila sa mukha ko siguro, e, talagang papunta na 'ko sa pagiging mascot!" joked Eugene. The comedienne also contradicted the observations raised by some critics who said that the star-studded cast, with their corresponding roles, overshadowed the plot's potential. "Hindi rin tatayo 'yon kung isa lang. Working Girls ito, e. Nagkataon lang siguro na pinakamaingay yata ako and 'yong character ko, napakaingay," Eugene explained. WANTS TO GO BACK TO THEATER. Eugene's television career is just as successful as her film ventures. Aside from Comedy Bar, the amiable comic is also seen in Wachamakulit and the coming-of-age series, First Time. Winning an award, though certainly welcome, is not a fixation for the 2007 Metro Manila Film Festival Best Supporting Actress. "Okay lang kahit manalo o matalo," smiled Eugene. But there's one thing Eugene would like to do again in the immediate future, following her mainstream success. "Gusto ko ulit mag-theater," she confessed. "Sana next year makabalik ulit ako sa stage acting."